Jessie Brennan participated at Coup de Ville 2013. This text was published in the catalogue. Jessie Brennan creates graphics and (large-scale) drawings that only come about through patience and with great intensity of labour. As an observer of an environment, she assumes a clinically distant position: socio-historical research, personal experiences, memories, folklore, myths and the exchange of local stories between herself and inhabitants nourish the final result. She exhibits one of her key works, The Cut from 2011, in a new context. The five-metre long panoramic drawing depicts the geography, life and past of the Hackney Cut, a canal in East London that underwent radical changes for, among other things, the construction of the Olympic site. She produces in extreme detail real and imaginary scenes in which various viewpoints and scales flow into one another seamlessly. The grey, hybrid world somewhere between still life and landscape is populated by miniature figures. She connects a detail from the drawing to a nineteenth-century sled from a local collection. 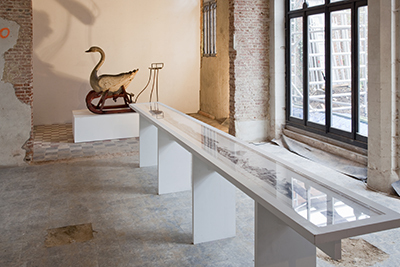 The combination of her drawing with the – architecturally eclectic – location and the sled evokes new associations which are related to her inquiry into the identity and nature of a place and its inhabitants. 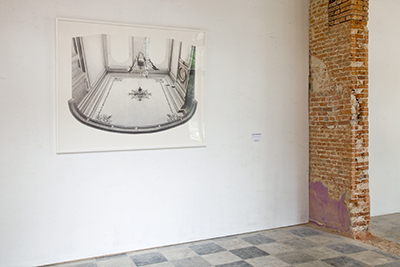 In response to the subtitle of the exhibition, ‘Attracted by another level’, while prospecting she became fascinated by the chandeliers and ceiling decorations in the former residence of artist Jan Buytaert. When she used to become bored as a child, she would often turn over while lying on the sofa, her head upside-down so that ceiling and floor were reversed, creating a new, fascinating space. The space in inversion that Brennan has meticulously represented in pencil appears to be a curious theatre décor with peepholes, a mirror and a light sculpture with abundant mouldings. After having read Margaret Wertheim’s The Pearly Gates of Cyberspace*, the artist interprets the space, with reminiscences of the deceased occupant, by means of the medieval dualism in which the physical and the immaterial enchant an environment. The drawing is thus associated with presence and absence: a means of holding on to something, of remembering and imagining – which are the foundations of Jessie Brennan’s oeuvre.